Gaeldom arrives early on the West Highland line. Within minutes of leaving Glasgow, bilingual patriotism takes a shy bow at Dalmuir, where Beardmore built the first airship to fly the Atlantic both ways. These days they don't build much at Dalmuir except high-rise blocks. Dalmuir is so exhausted that even the station sign has keeled over and died, Gaelic translation and all. After Bowling's abandoned hulls, and a nice view of the horror known as Faslane, we need a bit of cheering up on the 12.42 to Oban on Friday 10 January. Rikki Fulton and the boozy rabble half-suffocating each other in Princes Street are already distant memories. We have made it to a hangover dated 1997. The disembodied voice that does the cheering up is that of our conductor. 'We'll be at Helensburgh Upper for six minutes,' he confides matily, 'so if you want a wee smoke you can have one on the platform.' It is a generous offer, but there are no takers for the timetabled fly one. The smoke break lasts six minutes all the same. Ahead of us we have melodious Crianlarich, where summer tourists disembark briefly for tea and buns in the splendid station cafe. No point in hanging out here; the splendid station cafe is shut till Easter. Crianlarich is also where the unwary passenger panics. It is the junction at which the train divorces, a decree absolute with no hope of reconciliation. 'If there are any passengers who unfortunately have to go to Fort William,' advises our conductor, 'will they please leave now.' This is a man who knows his Fort William. Passengers on the first two coaches – the lucky ones bound for Oban – avail themselves of a little something from the trolley as a reward for choosing the right half of the train. Make that a cheddar cheese sandwich with pickles. Any wine? Aye. For the Oban select, there is even wine. Lukewarm, but who's complaining? Scotland appears to be in a state of suspended animation. Lochs, rivers, waterfalls are immobilised by a second hard winter; few birds sing. Between Loch Awe and Connel, I count one Hieland coo and one sheep. By the time we reach Oban it's three in the afternoon and the cars have their lights on. I'm swiftly on the Isle of Mull ferry, where the High School boarders returning to Mull after the first week of the new term swarm round the fruit machines. Little has changed since my last exposure to CalMac. The cafeteria continues to smell of curry. The paper shop continues to go big on the Weekly News. 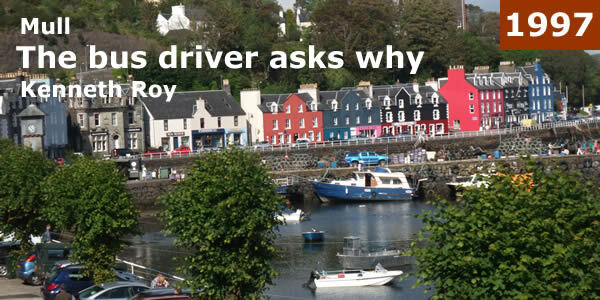 I once wrote an affectionate chapter (in a book of Scottish travels) about the practice of island drivers of giving passengers on service buses an idiosyncratic commentary to while away the hour to Tobermory. The fact that the commentary, which I reproduced pretty well verbatim, included the odd wry observation on local characters seemed to me to add to the charm of the piece. Islanders disagreed. 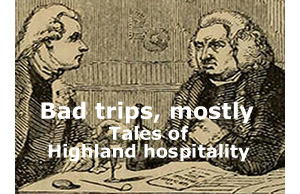 They wrote in numbers to the Glasgow Herald, which had republished the chapter, complaining that I had ridiculed Mull. In the circumstances, perhaps it would be prudent to arrive under cover of darkness; and it is very dark indeed when the Isle of Mull berths at Craignure. As a precautionary measure, I pull a ski hat over my head before daring to board the bus to Tobermory. It is the sort of camouflage favoured by urban gangsters. Uh-huh, I've planned this trip with some care. The driver spurns my offer of a fare: he will collect it at the other end. Six pilgrims take off, but only one of the school-children from the boat is still with us, the others having decanted into the Fionnphort bus to the far south of the island. Ours is a wee bus, a shoogly bus, with seats just about big enough for visiting fairies from North Uist. A man of moderate girth such as myself requires two for comfort. After a short distance, it is plain that we are not to have a commentary. Either commentaries were banned as a result of my book, or they are superfluous because there is nothing to see. The moment we leave Craignure for the bumpy 21-mile ride to the island capital on the narrowest of roads, we are plunged into that inky blackness which gives the Hebridean night such a thrilling quality. It is a filthy one too. It has started to snow – heavily. But we are cosy enough in here. We even have a tape of country and western music for company. Soon, hypnotised by the swish of the windscreen wipers, we're listening with half an ear to sad songs about lost love and watching big flakes swirl and dance across the window. I'm stirred from this reverie by a sharp turn of the bus, which comes to a full stop in the middle of nowhere. 'It is a boat,' someone is replying. But our eyes deceive us. It is not coming up the road. It is actually on a stretch of water separating Mull from the peninsula of Morvern. We are parked perilously close to a slipway at a place called Fishnish, and the child who has been with us since Oban is about to embark on a landing craft. At Tobermory we climb down into the snow, which has turned into a dismal sleet. Tobermory used to be called Scotland's smallest burgh, until they did away with burghs. It's officially only early evening, and it's Friday, yet the place is deserted. But I admire, as one does, the crescent-shaped main street, as multi-coloured as Joseph's coat, overlooking one of Scotland's more delightful harbours. In the dining room of the Tobermory Hotel, there are just the three of us. The others are a young couple from Inverness, talking earnestly about the growth of the rabbit population near Aviemore. At 11pm, the town clock tolls. Saturday, quite early. It is pelting down, and here am I noting the contents of Brown's the Ironmongers' window display: a Stir Fry Pan Set, a cork screw most functional, a Cookie Cutter and a Banana Tree. Another shop advertises 'Curry Ingredients.' The sweetie shop has one of those trays where every item costs a penny. The Isle of Mull Museum won't be opening until April, sensible museum that it is, and the Youth Hostel hopes to be reconstructed by May. There is a restaurant called the Captain's Table, but no sign of the captain or his crew. Back in three months, no doubt. I scan the window of the post office for information about buses. Information there is none. Inside, an elderly couple are busy sorting the papers. 'You couldn't tell me about the buses?' I inquire tentatively. 'No,' she replies. Well, that's clear enough. This Scottish habit of asking questions in the negative; it must be bred in the bone. 'You could fetch one at the pier,' she suggests. Having arrived with the intention of returning to Oban on today's last ferry, I've changed my mind: I'll stay a second night. This means I can spend the whole day on buses and not have to worry about catching the boat. Eventually I lay my hands on the elusive timetable and confirm that it is possible to bus it all the way from Tobermory to Fionnphort and then ferry it over to Iona. Given the tight co-ordination of island transport, I will have all of 10 minutes on the sacred turf. It should be enough. A first bus takes me as far as Craignure. A second bus will take me to Fionnphort via Bunessan. Nothing could be simpler. The driver thinks otherwise. 'Where are you going?' he asks as I attempt to board his vehicle. Why indeed? There was no satisfactory reason for going to Fionnphort via Bunessan on a sodding wet day in not quite the middle of January, then for foolishly proceeding to Iona and having to leave it after 10 minutes. Come to think of it, there was no satisfactory reason for getting out of bed at all, especially as the Tobermory Hotel provided en-suite tea-making facilities and a convenient fire escape. 'I'm just going for the run,' I tell the driver. A lame excuse, it has to be admitted. He shakes his head in despair. He’s heard it all now. But he ushers me on anyway. 'People don't realise how big Mull is,' a man at the CalMac office had said. 'We have 300 miles of coastline.' On the Fionnphort bus via Bunessan, it feels like more. I nod off, look at some bleak landscape, nod off again, look at some more bleak landscape, and still it pours. I am, however, happily distracted by the island newsletter, Round & About, started six months ago by two newcomers to Mull, Mr and Mrs Cleave. It is an informative publication, well produced and widely distributed, but its editorial ethos might be surprising to anyone unfamiliar with the changing nature of Gaelic Scotland. One long article is devoted to Reiki, not a mis-spelling of Glasgow's best known traffic cop as you might expect, but an ancient form of alternative healing rediscovered recently by Dr Mikao Usui, a fasting monk on a mountain (though not one of the local Cuillins range). 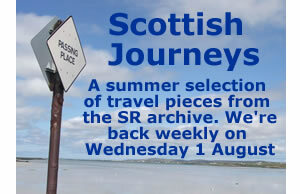 At Fionnphort, there is unsettling news: services to and from Iona have been suspended because of technical problems. Divers have been called to investigate what is wrong with the ferry. There may not be another sailing today. The pub, which is called the Keel Row, is warm if not exactly welcoming. Of the five boozers at the bar, three are English, all living locally. There had been a prodigious drinking session the night before. People boast of what they drank, what they didn't drink, what they wished they'd drunk, and how much they'll be drinking tonight. Drink, drink, drink ... it is the sole topic of conversation. Sunday morning, and it's still chucking it down. On the bus to Craignure, it occurs to me that during 36 hours on Mull I hadn't heard a word of Gaelic; I hadn't heard so much as a West Highland accent. Where does modern Gaeldom begin? Where do those bilingual signs stop being PR and start being real? Not at Dalmuir, certainly. But not on Mull either, it seems. The boundaries of an ancient culture are being pushed further and further back until maybe, one day, the culture itself will disappear into the Atlantic, there being nowhere else for it to go. Back in Oban, I discover that the 12.35 train to Glasgow stopped last October and that there isn't another until the evening. Oban is one big waiting room, and I'm doomed to join the queue. But there is a God. A bus appears, a smart-thinking city-linker. The driver doesn't ask why. Nor do I.